The Dalles is the county seat and largest city of Wasco County, Oregon, United States. On the next day, examine the collection at Western Antique Aeroplane & Automobile Museum and then contemplate the geological forces at Mount Hood. For maps, ratings, traveler tips, and tourist information, refer to the The Dalles trip planner . Arcata to The Dalles is an approximately 8.5-hour car ride. You can also fly. When traveling from Arcata in May, plan for a bit warmer days and about the same nights in The Dalles: temperatures range from 76°F by day to 50°F at night. Finish your sightseeing early on the 17th (Fri) so you can drive to Corbett. Corbett is an unincorporated community on the Columbia River in eastern Multnomah County, Oregon, United States. 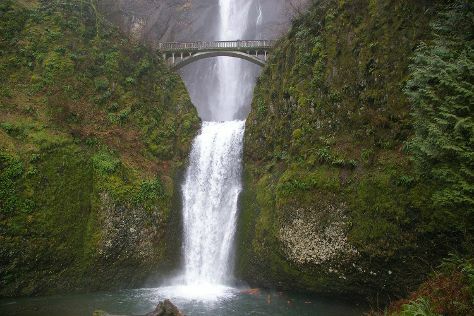 On the 18th (Sat), take in the dramatic natural features at Oneonta Gorge, take a memorable drive along Multnomah Falls, then admire the engineering at Bonneville Lock & Dam, and finally take in the dramatic scenery at Multnomah Falls. Get ready for a full day of sightseeing on the next day: contemplate the long history of Columbia River Highway, take in the dramatic scenery at Latourell Falls, and then admire the landmark architecture of Vista House. To see photos, maps, and other tourist information, read Corbett day trip planning site . Getting from The Dalles to Corbett by car takes about 1.5 hours. Traveling from The Dalles in May, you will find days in Corbett are little chillier (71°F), and nights are about the same (50°F). Finish up your sightseeing early on the 19th (Sun) so you can travel back home.